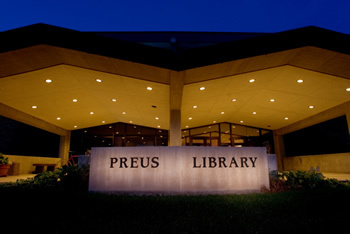 Preus Library has three floors that are accessible to the public. You enter the library on the second floor, or main level. This second floor is really the hub of the library, housing many of the library's resources and services. Most of our books and periodicals are shelved on the upper and lower levels using the Library of Congress classification system. All three floors have open study areas that can be used by individuals or groups (the upper level tends to be more quiet than the main level). Also, private individual and group study rooms are available on each floor.